The Dynamic dependent dropdown list box will auto fill data in the select box based on the parent select box selection. This type of dynamic dependent select box mainly used in selection of country-state-city or category-subcategory. It will load dynamic data in dropdown select boxes without refreshing of page then this type of feature will makes our web application more user-friendly. By using Jquery with Ajax we can simply developed this type of dynamic dependent select box feature without refresh of web page. 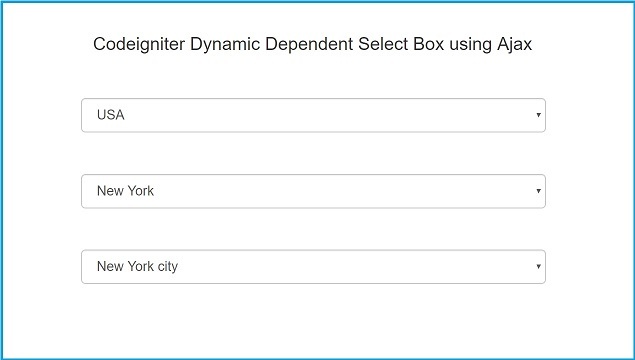 In this Codeigniter web tutorial, We will learn how can we make dynamic dependent select box or dropdown in Codeigniter by using Ajax with Jquery and Mysql database. For display dynamic dependent dropdown feature, here we will take example of relational select box of country state city in Codeigniter. Here State select box data will be related to country select box and city select box data will be related to state select box. By the selection of dropdown select box of country and state then dependent select box of state and city data will be get from the mysql database without refresh of page by using Ajax with Jquery in Codeigniter. Here In this example on page load it will displays countries data in country select box. When we have select country then respective states data will be fetched from mysql table and display under the states dropdown without reloading of page. Same way when user has select state from state dropdown then selected state cities data will be fetched from mysql database and fill under city dropdown. For Store data of country, state and city and these three table has been required to created into mysql database. And in all three tables would be connection between country, state and city table. Here first relationship between country and state table and second relationship between city and state table. Below SQL script will makes country table in Mysql Database. Below SQL script will make state table in your Mysql Database. Below SQL script will make city table in your Mysql Database. Here this Dynamic_dependent Contollers has 4 functions like __construct(), index(), fetch_state() and fetch_city(). __construct() - This function has been load Dynamic dependent model. index() - This function has retrived country data from mysql database using Dyamic dependent model and pass this data to view file. fetch_state() - This function retrived state data from mysql database based on country id using dynamic dependent model and return data in html format to ajax request. fetch_city() - This function has retrived city data from mysql databse based on state id using dynamic dependent model and return data in html format to ajax request. This Dynamic dependent model has four functions like fetch_country(), fetch_state($country_id) and fetch_city($state_id). fetch_country() - This function fetch data from Mysql database and return result data in PHP object. fetch_state($country_id) - This function fetch data from Mysql database based on value of country id and return back data in html format. fetch_city($state_id) - This function fetch city data from Mysql databse based on value of state id and return back data city data in html format. In Jquery code you can find when we have select country from country dropdown, then selected country id has been pass as data to controller and fetch_state() method of controller will fetch state data based on selected country id from mysql databse by using model and that model return state data in html format which has send by controller to ajax request and filled into state dynamic dropdown. Same way in state dropdown also, when we have select state from state select box, then in ajax request it has pass state id as data to fetch_city() controller method and that method will fetch city data based on value of state id from mysql database by using model and that model return city data in html format and after this controller has return that data to ajax request and it will fill city dynamic dropdown with data. Lastly, in this post we have make dynamic dependent dropdown in Codeigniter using country, state and city example. By using this type of example we can easily create relational dropdown whichever type of dynamic data.